Version 0.7 released 24 July 2009. If it looks a little old school, it's only because I've been trying to make this game since 1980. But other things kept getting in the way. Hope you have some fun with it. Play Asciiroth using Firefox, Chrome or Safari. IE8 works, but it's slower. There's no registration or server account needed. If it says "Install Google Gears" to the right, you can install that plug-in to save your games. Install Asciiroth using Adobe AIR. Windows, Mac or Linux. This is the "hold it in your hands, works everywhere" way to play. The guide talks tactics and introduces many of the things you'll find in the game. News: The game has been updated to work in Safari 4, Chrome, and Adobe AIR 1.5.1. You don't need to install a plug-in to save games in these browsers. A new scenario will be coming sometime this year, and that will wrap up a 1.0 release. Over a dozen new pieces are available in the level editor, including pieces for more RPG-style play. Thanks to everyone who has written in with comments, bug reports, and suggestions! It makes it all worthwhile to hear someone finished the game. Asciiroth has a map editor that can be used to create maps. Read the Guide to Creating Asciiroth Maps for details, and the API documentation for a description of all the available pieces and how they work. I'm also happy to answer questions and/or fix the code if it's needed to create scenarios. Only available as an AIR application, because it needs to load and save map files. WARNING: It's impossible to work on either the code or the maps without encountering spoilers. You might want to play the game first. If I can ever figure out why... I'll fix it. The Ant script also bundles the game using Adobe AIR for distribution to end users. If you retrieve the code and can't get set up to work by looking at the build.properties file, please email me. Patches welcome... you can also create scenarios which doesn't require any programming, and is probably more valuable to everyone's overall enjoyment of the game. Updated to GWT 1.7. The game will now work in Safari 4 and Adobe AIR 1.5.1. Support for HTML 5 database persistence. On Safari 4 you no longer need a plugin to save games, it will just work. I expect the same to be true of Firefox as well, in some future release. Tons of new pieces: waterfalls, rafts, bridges, campfires, mushrooms, kiwis, apples, bread, daggers, slings, hammers, colored wall pieces, trash heaps, haystacks, pressure plates, crevasses, pylons and crystals to open the pylons (most to create a scenario that's a little more RPG, a little less puzzle-oriented). Ranged weapons can (optionally) require ammo to use, and you can place ammo in the editor. Chests/crates can hold multiple items. Fixed bug where you couldn't finish TOA scenario, a but that users would not find until being literally one step away from victory. Easily the meanest thing I've ever done as a programmer, if not the Hooloovo. Updates to the gold castle scenario. 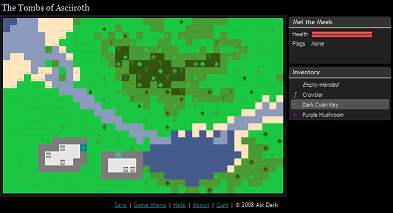 New scenario, usability enhancements to map editor, some bug fixes. Fixed a bug that messed up the ending of the TOA scenario; worked on performance. The game now works quite well in IE8 although there are some further steps that can be taken. Save game did not work correctly (SQL was wrong). You can now save a game under a different name, so you can have more than one save point in a game. You can now load a scenario from the new game dialog (AIR only), so they don't have to be included directly in the game. Map making instructions are updated to describe how to create a functional stand-alone scenario, and the editor allows you to enter the scenario data, so that closes the loop on that. Bug fixes to maps and pieces, mostly minor to the game, although you can now pick stuff up that lands on low terrain like chests, crates and urns. Addresses focus goofiness, and keyboard shortcuts not working to control the browser. Fixes for a number of reported bugs. Keyboard mapping revised to work on international keyboard layouts. Font symbols revised for better compatability. Mouse-based navigation improved a bit. Fixed a bug that hanged saving when there's something continually flying through the air. This is a complete release. After this, I'll try and keep things backwards compatible. The main TOA scenario and a tutorial are done (probably will be tweaked further). Performance work (bit flags, compile-time class swapping, etc.). A large number of new pieces have been added, including many more agents and some pretty entertaining puzzle pieces like the reflector and the force field. The "AI" (if you could call it that) has been improved. Agents navigate doors and corners now, and use breadcrumb pathfinding to track the player. The map editor now includes the ability to play a map in preview mode, which is extremely helpful when developing maps. See the help doc from within the editor. A lot of cleanup of the code, and expansion of lifecycle methods. Implement WHAT 5 storage provider, so you can save games as this becomes available in browsers (particularly Safari). 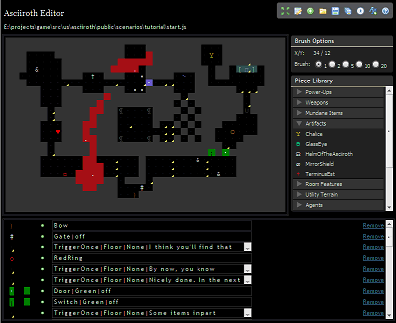 The Tombs of Asciiroth and the map editor are provided under the Apache 2.0 license. The development tools are, with the exception of Adobe AIR, open source under various licenses. AIR isn't necessary to build the game and/or play it in a browser.